TVs these days are thinner than they’ve ever been but what you gain in a crystal clear LCD, you lose in audio quality. Since there’s less room inside for speakers, audio is often muffled and sub-par and it’s not always obvious until you try playing a movie using a decent sound system. The problem with this is that not everyone has room for a full 5.1 surround sound setup. Don’t worry! There is an alternative: the soundbar. These lay in front of your TV set and direct audio towards you, plus they often sound far better than the built-in speakers. We’ve found four of the very best soundbars on the market for less than $100 so you can listen to music and hear your favorite shows the way they were meant to be heard. In the table below, you’ll find the name of each product we’ll be reviewing as well as a couple of their important specifications. This is just a brief preview though, there’s much more to be said about each soundbar below. Without further ado, let’s begin. We’ll be examining each of our top recommendations to find any areas where they excel or might need some work. We’ll also be trying to find the person each soundbar is best suited for based on its characteristics. Now that’s out of the way, we’ll take a look at the Dell AC511 USB Wired Soundbar. Most of the products on this list are designed for use with a TV set, but sometimes you want the best possible audio from your PC too. That’s where the Dell AC511 USB Wired Soundbar comes in – it’s a USB-powered plug and plays solution that outputs far punchier audio than your stock PC speakers. It’s the least expensive soundbar in this list, retailing at around $25. For this price, you might not be expecting anything particularly powerful, but this model doesn’t disappoint. It uses two 1.25W speakers to produce clearly defined audio with a good amount of bass and treble. The sound profile seems pretty balanced – the bass never overpowers the higher notes and vocals come across crisp and clear. Similarly, the treble avoids sounding washed-out and comes across very well in instrumental pieces of music. Unfortunately, any tweaks to the EQ have to be done from within your operating system as the only physical control this soundbar has is for the volume. This model is fairly small in stature. It’s just 16” wide, 1.9” deep and 1.5” tall, which means it can easily fit onto just about any desktop. If space is a little tight though, there is another way – it can be hooked onto certain Dell monitors using its T-hook. From here, it’s just a simple matter of plugging it into the monitor’s USB port – we did notice a slight static noise when we tested this, but the problem was completely solved when the soundbar was plugged into the PC instead. You don’t have to settle for lackluster audio just because it’s late at night – this soundbar has a headphones jack and even an auxiliary port. This means that if you wanted to listen to the music on your phone in higher quality than your phone’s speakers could produce, it’s a simple matter to connect these two items to the bar and listen away. It also comes with one year’s limited warranty, so even if something goes wrong or it breaks, you won’t have to pay another penny towards it. The one major downside of this soundbar is that it won’t work in a TV. It’s reliant on being able to receive audio via USB, which is something most TVs just can’t do. Also, even though the sound is likely to be a significant step up from your standard speakers, there is a limit to how good a soundbar can be for under $30. Don’t go expecting cinema-style audio, but for general use, it’ll do just fine. Ultimately, this soundbar is well worth the price. It is by far, one of the simplest ways to upgrade your computer’s audio output and whilst it can’t work miracles, it does produce a punchy, vibrant sound with a balanced profile. Considering it costs less than $30 and comes with a yearlong warranty, you really can’t go wrong. Sometimes you want something with a little more power than your stock TV speakers. Maybe you’re a movie buff and want to be blown away by the audio. If this sounds like you, the Richsound Research TB220L might be a good choice. It’s a 32” soundbar, so it’s ideal for medium-sized TVs. It has a peak power output of 30W, a root means square power of 2x 8W and uses its two audio channels to simulate surround sound. The audio from this bar is exceptional. It doesn’t have a subwoofer or amplifier, but it still manages to produce strong, powerful bass without muddying the higher range. In a very large room, you might find it a little underwhelming, but anywhere else, it’ll be more than loud enough. You have a choice of inputs with this model. Connect it to your TV using an optical or auxiliary cable, or play music straight from your phone using the soundbar’s built-in Bluetooth receiver. This product even comes with its own remote control, although this does have a couple of issues. Firstly, you can’t control the soundbar with your TV remote. You can still use that to control your TV, but you’ll have to use the soundbar’s one to change volume. Secondly, the remote control is a little cheap feeling and has clicky buttons which can be difficult to press if you have carpal tunnel or hand mobility problems. If you don’t have space underneath your TV or if it would clutter up your TV stand, you can always mount this bar to a wall. It comes with all the instructions and anchors you’ll need to do this, so you can get it properly mounted in less than ten minutes. For what it’s worth, though, we think this model looks great parked right in front of the TV, so it’s really up to you whether you want to mount it or not. Another slight annoyance with this product is its automatic sleep mode. After around 15 minutes of not receiving a signal, it turns itself off. This is fine if you’re done for the night, but if you leave the TV paused for a while and come back, you’ll have to turn the soundbar back on with the remote control. We were pleased to see the inclusion of a manufacturer’s warranty with this product. Richsound Research will cover it for up to a year after the date of purchase, so should anything go wrong, you’re covered and won’t have to spend any money on a replacement. Given that the soundbar itself only costs $60, that’s a pretty good coverage time. There’s a lot to like about this product. It’s a solid, mid-sized soundbar with crystal clear sound and a host of ease of use functionality like its remote control and Bluetooth capability. Whilst the bass isn’t the strongest, you’re unlikely to find anything more powerful for less than $60. 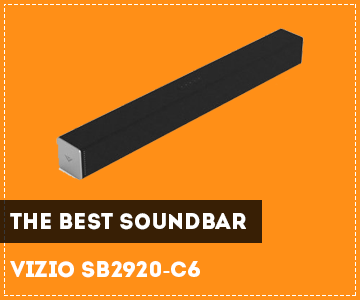 The VIZIO SB2929-C6 is one of the more high-end soundbars on this list, but we feel it justifies its higher price, and we’ll tell you why. First and foremost, it sounds great – music comes through sounding crisp and clear, plus VIZIO have found a good balance between the bass and the treble. The speakers are powerful despite their relatively small size and can create a sound all the way up to 95dB. At extremely high volumes, there is some distortion, but it’s very unlikely you’ll be listening to it that high since even at 80%, it’s way too loud. We have a feeling your neighbors will complain before you start hearing any distortion over your audio. Also be sure to check out this video, which tells you if a $70 soundbar is worth it. This bar is 29” long and has two speakers which use DTS TruSurround to mimic the effects of a real surround sound system. They also use TruVolume to regulate the volume between songs so you don’t turn it up too loud to hear a quiet song and scare yourself half to death when the next one comes on. There’s no amplifier or subwoofer included with this model, but if you wanted to, you could connect one at the back using the optical or auxiliary cables. You can also use Bluetooth to connect your devices to this soundbar and play your music that way. This model comes with a remote control and it’s definitely a step up from the last product. For starters, you don’t necessarily even need it: once you connect the soundbar to your TV, you can do all the basic things like changing volume with your TV remote. If you’d like to go a bit more in-depth and change the bass or treble mid-song, though, you’ll need the dedicated remote to do so. It needs 2 AAA batteries to work and these are included, which is great. This soundbar, like the last one we saw, can also be mounted to a wall, but unfortunately, the brackets aren’t provided, so if you want to attach it to something, you’ll need to pick these up too. This product costs a little under $80, but to help give you some peace of mind, VIZIO provide a one-year warranty which covers the cost of replacement parts and labor. This means that even if the worst should happen, and there isn’t a nearby repair place, you only have to pay the shipping costs and they’ll take care of the rest. This soundbar isn’t for everyone. Its relatively high cost will be off-putting to those on a tight budget and not everyone is going to want or need a very loud speaker. For those who do, though, you’d be hard-pressed to find a better one without spending a lot more money. The remote control offers a great amount of customization and the ability to add your own devices makes this product attractive to casual music fans and audio enthusiasts alike. The BÖHM soundbar is not going to fit everybody’s budget. It slips in just under the limit for this article, at around $90 but justifies its higher price point by providing more freedom to do things your way. First of all, this soundbar looks great. It has a black metal grille and white trim at the sides, plus its shape is very modern and will look amazing on top of the right TV stand. 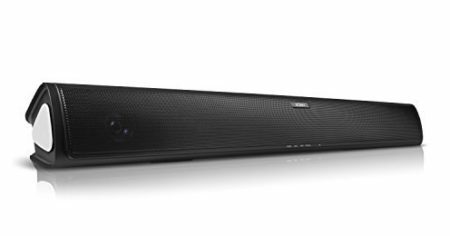 It’s a 60W soundbar, so you know it’s capable of producing exceptionally loud audio. Despite this, music comes across clearly, with a strong midrange and a decent bass to boot. The higher frequencies aren’t neglected or drowned out in any way – a common problem in less expensive soundbars. Additionally, there are three audio modes: movie, music and night. Movie and movie emphasize different parts of the audio to enhance your experience and night mode limits the maximum volume so you can listen… well, at night. The included remote control provides the ability to boost bass or treble on the fly and if you enter the code for your TV, you can ditch your old remote, controlling everything with the soundbar’s one. This soundbar has Bluetooth 4.0 connectivity, but you can also use an optical cable or one of the 2 auxiliary jacks to connect your device. Which is best depends entirely on the device and your personal preference – if wires annoy you, use Bluetooth. The soundbar is 31.5” wide so it’s designed for medium to large TV sets. It’s 3.2” deep and 3.8” tall, so despite its width, it doesn’t take up too much room in any other direction, although it is significantly heavier than its competitors at 9.2 pounds. Everything you need to mount this soundbar to a table or wall is included in the box: that’s instructions and more importantly, the actual brackets. This saves you a trip to the hardware store, so it’s nice to see them included. BÖHM have also thrown in all of the cables you’ll need – one 3.5mm and one optical cable, so you don’t have to rummage around and see if you have a spare lying around. The only real issue we found with this product is its instructions. There’s plenty of information on how to mount it to a wall, but surprisingly little on how to actually connect it to your TV, which is a shame since it prolongs the setup process by quite some time. We’re actually pretty impressed with this model. It’s loud enough for just about any occasion, and its night mode makes it invaluable if you share your home and like to stay up late watching TV. The array of different input options is a massive plus, as is the inclusion of a mounting kit and versatile remote control. If you can justify spending around $90 on a soundbar, you won’t regret buying this one. Buying a soundbar doesn’t have to be a confusing experience. If you have a basic understanding of speakers, it’s easy to work out which specifications are important and if you don’t, don’t worry, because we’re about to tell you anyway. Our buyer’s guide will help you find the best soundbar under $100 for your needs. It’s worth taking a few minutes to look over it since it could save you a lot of money in the long term. Firstly, take a look at the device you’d like to connect the soundbar to. For the majority of soundbars, you’re going to need a place for your optical cable or auxiliary cable, unless you’re lucky enough to have a TV with Bluetooth support. Just connect the bar, follow the setup instructions and you should be good to go. Consider the size of the soundbar. Smaller models will be easier to find a location for, but often lack the power of a larger model and can sound weak in comparison. Bear in mind that these products are intended to lie in front or underneath a TV set, so try to find one that’s roughly around the same size so it doesn’t look strange. If you’d like to mount the bar onto a wall instead, that’s fine. Most soundbars offer this option, although not all of them come with the things you’ll need to do it. Double check that the brackets or anchors are included before you spend any money – this will save you a trip to the hardware store on short notice. Speakers can be difficult to compare since quality is subjective. That said, there are a couple of ways to find out where a product lies in terms of audio quality. Firstly, check out the speaker size. Essentially, the larger the speakers, the more power they’ll need, and the louder you can play your music. That’s not all though: you’ll also have to pay attention to the frequency response. This refers to the range of sounds which the soundbar can output. These are often given in the form of a graph showing whether the bar favors bass, treble or the mid-range. Ideally, it’d be a flat line, but in the real world, there are always compromises to be made. As long as there aren’t huge spikes or dips in the graph, you’ll probably be alright. This is just a very basic explanation of frequency response, though, so if you’d like to know more, take a look at the article here. Most medium budget soundbars will try and emulate the experience of a surround sound system, with varying degrees of success. With some, it’s possible to connect additional speakers, subwoofers or amplifiers, so there’s likely to be room for adding improvements if you’re really into audio. So there you have it. Four of the very best budget soundbars on the market right now. They all have their own strengths and weaknesses, but overall, we’ve decided that the one which fits most people’s needs is the VIZIO SB2920-C6. Not only does it allow you to connect your mobile devices via Bluetooth, you can also crank the volume up really loud if you want to. It comes with its own remote control and even allows you to adjust the sound of your music mid-song using the bass/treble buttons. As if all of that wasn’t enough, it costs less than $90! We hope that you’ve found this article useful, and if so, we’d love to help you out again. Just stop on by the next time you need product advice, we’ll be here. Until then, have a great day and happy listening.